I'm just wrapping up a quick trip to Portland, Oregon - but I made this just before I left. You all know by now how I love a rustic, family-style dessert. And really, the list of desserts that fit the bill better than a simple fruit crumble is short. 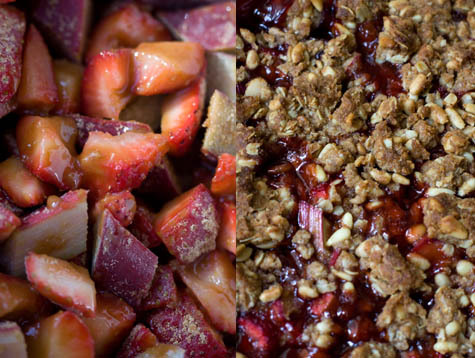 For those of you who've never attempted a crumble, it's quite simple. Start with fresh seasonal fruit, top it with crumbled dough, and into the oven it goes. Before you know it, golden-topped dollops of baked goodness are crisping up in a shallow sea of bubbling fruit. In this version I combined rhubarb, strawberry, and a splash of port wine with a buttery black pepper, pine nut and oat crumble. Sounds a bit fancy, but really, it couldn't be easier to make. With this particular crumble, you can prep the ingredients up to ahead of time if you like. Combine the dry ingredients, cover, and set aside. Chop the fruit, cover, and refrigerate. The rest of it comes together in a flash whenever you're ready to assemble the crumble and bake it off. Feel free to experiment with the amount of sugar in this based on how sweet your berries are. For example, try it with 1/2 cup sugar tossed with the fruit, and make note - you might want it more/less sweet the next time around. Preheat the oven to 375F / 190C, with a rack in the middle. Butter a 10-inch round gratin dish (pictured), or a 9x9 square baking dish. Combine the flour, pine nuts, oats, sugar, salt, and pepper together in a bowl. Use a fork to stir in the butter, squeeze into a few patties, then place in the freezer to chill at least ten minutes. Make the filling by whisking together the cornstarch and sugar in a large mixing bowl. Add the strawberries and rhubarb, and toss until evenly coated. Wait three minutes, add the port and toss again. Transfer the filling to the prepared pan, remove the topping from the freezer, and crumble across the top of the filling - make sure you have big pieces and small. Bake for 35 - 40 minutes, or until the topping is deeply golden and the fruit juices are vigorously bubbling. You'll want to let things cool a bit before serving, 20 - 30 minutes. Serves a small crowd, 8 - 12 servings.